Naskhi script amid scrolling inlaid, silver palmettes that have been further engraved. The inscriptions include various Koranic verses and sayings. 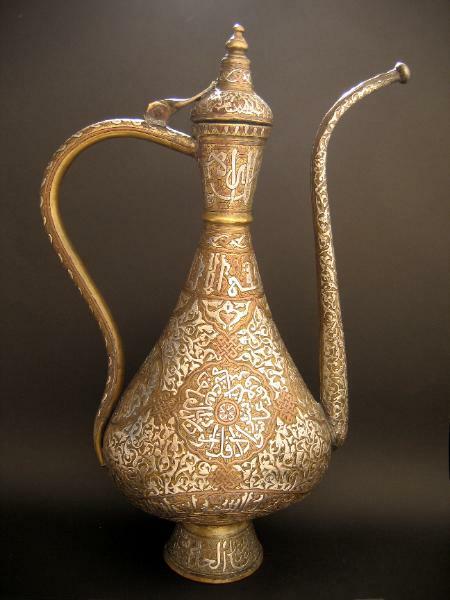 The work on this ewer is similar to that done in Egypt and Syria in the late 19th and early 20th centuries. However, the style and motifs suggest a different provenance, more likely Turkmenistan or Uzbekistan. Uzbekistan: Heirs to the Silk Road (Thames & Hudson, 1997) describes the Buddhist endless knot as a “leitmotif” for determining Central Asian origins in Islamic art. “Another typical Central Asian feature are circular medallions filled with quartered plant motifs to suggest a Greek cross,” says Kalter. The motif survives to this day in Central Asian art, possibly refers to the four elements: fire, water, earth and air. Bracket-lobed cartouches with a geometric design terminating in trefoils or endless knots are also typical of Central Asian provenance; bracket-lobed cartouches being reminiscent of stylised cloud motifs common in Chinese art. All these elements that Kalter attributes to a Central Asian provenance are present in this one, remarkable ewer.